Americium is a synthetic chemical element with symbol Am and atomic number 95. It is radioactive and a transuranic member of the actinide series, in the periodic table located under the lanthanide element europium, and thus by analogy was named after the Americas. Americium was first produced in 1944 by the group of Glenn T. Seaborg from Berkeley, California, at the Metallurgical Laboratory of the University of Chicago, a part of the Manhattan Project. Although it is the third element in the transuranic series, it was discovered fourth, after the heavier curium. The discovery was kept secret and only released to the public in November 1945. Most americium is produced by uranium or plutonium being bombarded with neutrons in nuclear reactors – one tonne of spent nuclear fuel contains about 100 grams of americium. It is widely used in commercial ionization chamber smoke detectors, as well as in neutron sources and industrial gauges. Several unusual applications, such as nuclear batteries or fuel for space ships with nuclear propulsion, have been proposed for the isotope 242mAm, but they are as yet hindered by the scarcity and high price of this nuclear isomer. Americium is a relatively soft radioactive metal with silvery appearance. Its common isotopes are 241Am and 243Am. In chemical compounds, americium usually assumes the oxidation state +3, especially in solutions. Several other oxidation states are known, which range from +2 to +7 and can be identified by their characteristic optical absorption spectra. The crystal lattice of solid americium and its compounds contain small intrinsic radiogenic defects, due to metamictization induced by self-irradiation with alpha particles, which accumulates with time; this can cause a drift of some material properties over time, more noticeable in older samples. The 60-inch cyclotron at the Lawrence Radiation Laboratory, University of California, Berkeley, in August 1939. The triangle in the glass tube contains the first sample of americium (as the hydroxide (Am(OH)3)), produced in 1944. Although americium was likely produced in previous nuclear experiments, it was first intentionally synthesized, isolated and identified in late autumn 1944, at the University of California, Berkeley, by Glenn T. Seaborg, Leon O. Morgan, Ralph A. James, and Albert Ghiorso. They used a 60-inch cyclotron at the University of California, Berkeley. The element was chemically identified at the Metallurgical Laboratory (now Argonne National Laboratory) of the University of Chicago. Following the lighter neptunium, plutonium, and heavier curium, americium was the fourth transuranium element to be discovered. At the time, the periodic table had been restructured by Seaborg to its present layout, containing the actinide row below the lanthanide one. 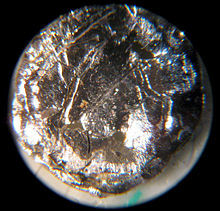 This led to americium being located right below its twin lanthanide element europium; it was thus by analogy named after the Americas: "The name americium (after the Americas) and the symbol Am are suggested for the element on the basis of its position as the sixth member of the actinide rare-earth series, analogous to europium, Eu, of the lanthanide series." The new element was isolated from its oxides in a complex, multi-step process. First plutonium-239 nitrate (239PuNO3) solution was coated on a platinum foil of about 0.5 cm2 area, the solution was evaporated and the residue was converted into plutonium dioxide (PuO2) by calcining. After cyclotron irradiation, the coating was dissolved with nitric acid, and then precipitated as the hydroxide using concentrated aqueous ammonia solution. The residue was dissolved in perchloric acid. Further separation was carried out by ion exchange, yielding a certain isotope of curium. The separation of curium and americium was so painstaking that those elements were initially called by the Berkeley group as pandemonium (from Greek for all demons or hell) and delirium (from Latin for madness). Initial experiments yielded four americium isotopes: 241Am, 242Am, 239Am and 238Am. Americium-241 was directly obtained from plutonium upon absorption of two neutrons. It decays by emission of a α-particle to 237Np; the half-life of this decay was first determined as 7002510000000000000♠510±20 years but then corrected to 432.2 years. The second isotope 242Am was produced upon neutron bombardment of the already-created 241Am. Upon rapid β-decay, 242Am converts into the isotope of curium 242Cm (which had been discovered previously). The half-life of this decay was initially determined at 17 hours, which was close to the presently accepted value of 16.02 h.
The discovery of americium and curium in 1944 was closely related to the Manhattan Project; the results were confidential and declassified only in 1945. Seaborg leaked the synthesis of the elements 95 and 96 on the U.S. radio show for children Quiz Kids five days before the official presentation at an American Chemical Society meeting on 11 November 1945, when one of the listeners asked whether any new transuranium element beside plutonium and neptunium had been discovered during the war. After the discovery of americium isotopes 241Am and 242Am, their production and compounds were patented listing only Seaborg as the inventor. The initial americium samples weighed a few micrograms; they were barely visible and were identified by their radioactivity. The first substantial amounts of metallic americium weighing 40–200 micrograms were not prepared until 1951 by reduction of americium(III) fluoride with barium metal in high vacuum at 1100 °C. Americium was detected in the fallout from the Ivy Mike nuclear test. The longest-lived and most common isotopes of americium, 241Am and 243Am, have half-lives of 432.2 and 7,370 years, respectively. Therefore, any primordial americium (americium that was present on Earth during its formation) should have decayed by now. Existing americium is concentrated in the areas used for the atmospheric nuclear weapons tests conducted between 1945 and 1980, as well as at the sites of nuclear incidents, such as the Chernobyl disaster. For example, the analysis of the debris at the testing site of the first U.S. hydrogen bomb, Ivy Mike, (1 November 1952, Enewetak Atoll), revealed high concentrations of various actinides including americium; but due to military secrecy, this result was not published until later, in 1956. Trinitite, the glassy residue left on the desert floor near Alamogordo, New Mexico, after the plutonium-based Trinity nuclear bomb test on 16 July 1945, contains traces of americium-241. Elevated levels of americium were also detected at the crash site of a US Boeing B-52 bomber aircraft, which carried four hydrogen bombs, in 1968 in Greenland. In other regions, the average radioactivity of surface soil due to residual americium is only about 0.01 picocuries/g (0.37 mBq/g). Atmospheric americium compounds are poorly soluble in common solvents and mostly adhere to soil particles. Soil analysis revealed about 1,900 times higher concentration of americium inside sandy soil particles than in the water present in the soil pores; an even higher ratio was measured in loam soils. Americium is produced mostly artificially in small quantities, for research purposes. A tonne of spent nuclear fuel contains about 100 grams of various americium isotopes, mostly 241Am and 243Am. Their prolonged radioactivity is undesirable for the disposal, and therefore americium, together with other long-lived actinides, must be neutralized. The associated procedure may involve several steps, where americium is first separated and then converted by neutron bombardment in special reactors to short-lived nuclides. This procedure is well known as nuclear transmutation, but it is still being developed for americium. The transuranic elements from americium to fermium occurred naturally in the natural nuclear fission reactor at Oklo, but no longer do so. 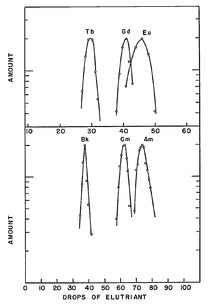 Chromatographic elution curves revealing the similarity between the lanthanides Tb, Gd, and Eu and the corresponding actinides Bk, Cm, and Am. Americium has been produced in small quantities in nuclear reactors for decades, and kilograms of its 241Am and 243Am isotopes have been accumulated by now. Nevertheless, since it was first offered for sale in 1962, its price, about 1,500 USD per gram of 241Am, remains almost unchanged owing to the very complex separation procedure. The heavier isotope 243Am is produced in much smaller amounts; it is thus more difficult to separate, resulting in a higher cost of the order 100,000–160,000 USD/g. The plutonium present in spent nuclear fuel contains about 12% of 241Pu. Because it spontaneously converts to 241Am, 241Pu can be extracted and may be used to generate further 241Am. However, this process is rather slow: half of the original amount of 241Pu decays to 241Am after about 15 years, and the 241Am amount reaches a maximum after 70 years. Most synthesis routines yield a mixture of different actinide isotopes in oxide forms, from which isotopes of americium can be separated. In a typical procedure, the spent reactor fuel (e.g. MOX fuel) is dissolved in nitric acid, and the bulk of uranium and plutonium is removed using a PUREX-type extraction (Plutonium–URanium EXtraction) with tributyl phosphate in a hydrocarbon. The lanthanides and remaining actinides are then separated from the aqueous residue (raffinate) by a diamide-based extraction, to give, after stripping, a mixture of trivalent actinides and lanthanides. Americium compounds are then selectively extracted using multi-step chromatographic and centrifugation techniques with an appropriate reagent. A large amount of work has been done on the solvent extraction of americium. For example, a 2003 EU-funded project codenamed "EUROPART" studied triazines and other compounds as potential extraction agents. A bis-triazinyl bipyridine complex was proposed in 2009 as such a reagent is highly selective to americium (and curium). Separation of americium from the highly similar curium can be achieved by treating a slurry of their hydroxides in aqueous sodium bicarbonate with ozone, at elevated temperatures. Both Am and Cm are mostly present in solutions in the +3 valence state; whereas curium remains unchanged, americium oxidizes to soluble Am(IV) complexes which can be washed away. Metallic americium is obtained by reduction from its compounds. Americium(III) fluoride was first used for this purpose. The reaction was conducted using elemental barium as reducing agent in a water- and oxygen-free environment inside an apparatus made of tantalum and tungsten. 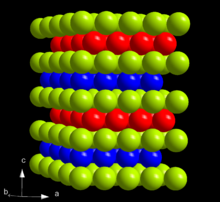 Double-hexagonal close packing with the layer sequence ABAC in the crystal structure of α-americium (A: green, B: blue, C: red). In the periodic table, americium is located to the right of plutonium, to the left of curium, and below the lanthanide europium, with which it shares many similarities in physical and chemical properties. Americium is a highly radioactive element. When freshly prepared, it has a silvery-white metallic lustre, but then slowly tarnishes in air. With a density of 12 g/cm3, americium is less dense than both curium (13.52 g/cm3) and plutonium (19.8 g/cm3); but has a higher density than europium (5.264 g/cm3)—mostly because of its higher atomic mass. Americium is relatively soft and easily deformable and has a significantly lower bulk modulus than the actinides before it: Th, Pa, U, Np and Pu. Its melting point of 1173 °C is significantly higher than that of plutonium (639 °C) and europium (826 °C), but lower than for curium (1340 °C). At ambient conditions, americium is present in its most stable α form which has a hexagonal crystal symmetry, and a space group P63/mmc with cell parameters a = 346.8 pm and c = 1124 pm, and four atoms per unit cell. The crystal consists of a double-hexagonal close packing with the layer sequence ABAC and so is isotypic with α-lanthanum and several actinides such as α-curium. The crystal structure of americium changes with pressure and temperature. When compressed at room temperature to 5 GPa, α-Am transforms to the β modification, which has a face-centered cubic (fcc) symmetry, space group Fm3m and lattice constant a = 489 pm. This fcc structure is equivalent to the closest packing with the sequence ABC. Upon further compression to 23 GPa, americium transforms to an orthorhombic γ-Am structure similar to that of α-uranium. There are no further transitions observed up to 52 GPa, except for an appearance of a monoclinic phase at pressures between 10 and 15 GPa. There is no consistency on the status of this phase in the literature, which also sometimes lists the α, β and γ phases as I, II and III. The β-γ transition is accompanied by a 6% decrease in the crystal volume; although theory also predicts a significant volume change for the α-β transition, it is not observed experimentally. The pressure of the α-β transition decreases with increasing temperature, and when α-americium is heated at ambient pressure, at 770 °C it changes into an fcc phase which is different from β-Am, and at 1075 °C it converts to a body-centered cubic structure. The pressure-temperature phase diagram of americium is thus rather similar to those of lanthanum, praseodymium and neodymium. As with many other actinides, self-damage of the crystal structure due to alpha-particle irradiation is intrinsic to americium. It is especially noticeable at low temperatures, where the mobility of the produced structure defects is relatively low, by broadening of X-ray diffraction peaks. This effect makes somewhat uncertain the temperature of americium and some of its properties, such as electrical resistivity. So for americium-241, the resistivity at 4.2 K increases with time from about 2 µOhm·cm to 10 µOhm·cm after 40 hours, and saturates at about 16 µOhm·cm after 140 hours. This effect is less pronounced at room temperature, due to annihilation of radiation defects; also heating to room temperature the sample which was kept for hours at low temperatures restores its resistivity. In fresh samples, the resistivity gradually increases with temperature from about 2 µOhm·cm at liquid helium to 69 µOhm·cm at room temperature; this behavior is similar to that of neptunium, uranium, thorium and protactinium, but is different from plutonium and curium which show a rapid rise up to 60 K followed by saturation. The room temperature value for americium is lower than that of neptunium, plutonium and curium, but higher than for uranium, thorium and protactinium. Americium is paramagnetic in a wide temperature range, from that of liquid helium, to room temperature and above. This behavior is markedly different from that of its neighbor curium which exhibits antiferromagnetic transition at 52 K. The thermal expansion coefficient of americium is slightly anisotropic and amounts to 6994749999999999999♠(7.5±0.2)×10−6 /°C along the shorter a axis and 6994620000000000000♠(6.2±0.4)×10−6 /°C for the longer c hexagonal axis. The enthalpy of dissolution of americium metal in hydrochloric acid at standard conditions is 2994379400000000000♠−620.6±1.3 kJ/mol, from which the standard enthalpy change of formation (ΔfH°) of aqueous Am3+ ion is 2994378800000000000♠−621.2±2.0 kJ/mol. The standard potential Am3+/Am0 is 2999792000000000000♠−2.08±0.01 V.
Americium ions in solution: Am3+ (left) and Am4+ (right). Am3+ is colorless at low and reddish at higher concentrations. 6 (dark green). All oxidation states have their characteristic optical absorption spectra, with a few sharp peaks in the visible and mid-infrared regions, and the position and intensity of these peaks can be converted into the concentrations of the corresponding oxidation states. For example, Am(III) has two sharp peaks at 504 and 811 nm, Am(V) at 514 and 715 nm, and Am(VI) at 666 and 992 nm. 4) in acidic solutions. Whereas the Am4+ ions are unstable in solutions and readily convert to Am3+, the +4 oxidation state occurs well in solids, such as americium dioxide (AmO2) and americium(IV) fluoride (AmF4). Three americium oxides are known, with the oxidation states +2 (AmO), +3 (Am2O3) and +4 (AmO2). Americium(II) oxide was prepared in minute amounts and has not been characterized in details. Americium(III) oxide is a red-brown solid with a melting point of 2205 °C. Americium(IV) oxide is the main form of solid americium which is used in nearly all its applications. As most other actinide dioxides, it is a black solid with a cubic (fluorite) crystal structure. The oxalate of americium(III), vacuum dried at room temperature, has the chemical formula Am2(C2O4)3·7H2O. Upon heating in vacuum, it loses water at 240 °C and starts decomposing into AmO2 at 300 °C, the decomposition completes at about 470 °C. The initial oxalate dissolves in nitric acid with the maximum solubility of 0.25 g/L. Halides of americium are known for the oxidation states +2, +3 and +4, where the +3 is most stable, especially in solutions. Another known form of solid tetravalent americium chloride is KAmF5. Tetravalent americium has also been observed in the aqueous phase. For this purpose, black Am(OH)4 was dissolved in 15-M NH4F with the americium concentration of 0.01 M. The resulting reddish solution had a characteristic optical absorption spectrum which is similar to that of AmF4 but differed from other oxidation states of americium. Heating the Am(IV) solution to 90 °C did not result in its disproportionation or reduction, however a slow reduction was observed to Am(III) and assigned to self-irradiation of americium by alpha particles. Most americium(III) halides form hexagonal crystals with slight variation of the color and exact structure between the halogens. So, chloride (AmCl3) is reddish and has a structure isotypic to uranium(III) chloride (space group P63/m) and the melting point of 715 °C. The fluoride is isotypic to LaF3 (space group P63/mmc) and the iodide to BiI3 (space group R3). The bromide is an exception with the orthorhombic PuBr3-type structure and space group Cmcm. Crystals of americium hexahydrate (AmCl3·6H2O) can be prepared by dissolving americium dioxide in hydrochloric acid and evaporating the liquid. Those crystals are hygroscopic and have yellow-reddish color and a monoclinic crystal structure. The known chalcogenides of americium include the sulfide AmS2, selenides AmSe2 and Am3Se4, and tellurides Am2Te3 and AmTe2. The pnictides of americium (243Am) of the AmX type are known for the elements phosphorus, arsenic, antimony and bismuth. They crystallize in the rock-salt lattice. Americium monosilicide (AmSi) and "disilicide" (nominally AmSix with: 1.87 < x < 2.0) were obtained by reduction of americium(III) fluoride with elementary silicon in vacuum at 1050 °C (AmSi) and 1150−1200 °C (AmSix). AmSi is a black solid isomorphic with LaSi, it has an orthorhombic crystal symmetry. AmSix has a bright silvery lustre and a tetragonal crystal lattice (space group I41/amd), it is isomorphic with PuSi2 and ThSi2. Borides of americium include AmB4 and AmB6. The tetraboride can be obtained by heating an oxide or halide of americium with magnesium diboride in vacuum or inert atmosphere. Analogous to uranocene, americium forms the organometallic compound amerocene with two cyclooctatetraene ligands, with the chemical formula (η8-C8H8)2Am. A cyclopentadienyl complex is also known that is likely to be stoichiometrically AmCp3. Formation of the complexes of the type Am(n-C3H7-BTP)3, where BTP stands for 2,6-di(1,2,4-triazin-3-yl)pyridine, in solutions containing n-C3H7-BTP and Am3+ ions has been confirmed by EXAFS. Some of these BTP-type complexes selectively interact with americium and therefore are useful in its selective separation from lanthanides and another actinides. Americium is an artificial element of recent origin, and thus does not have a biological requirement. It is harmful to life. It has been proposed to use bacteria for removal of americium and other heavy metals from rivers and streams. Thus, Enterobacteriaceae of the genus Citrobacter precipitate americium ions from aqueous solutions, binding them into a metal-phosphate complex at their cell walls. Several studies have been reported on the biosorption and bioaccumulation of americium by bacteria and fungi. The isotope 242mAm (half-life 141 years) has the largest cross sections for absorption of thermal neutrons (5,700 barns), that results in a small critical mass for a sustained nuclear chain reaction. The critical mass for a bare 242mAm sphere is about 9–14 kg (the uncertainty results from insufficient knowledge of its material properties). It can be lowered to 3–5 kg with a metal reflector and should become even smaller with a water reflector. Such small critical mass is favorable for portable nuclear weapons, but those based on 242mAm are not known yet, probably because of its scarcity and high price. The critical masses of two other readily available isotopes, 241Am and 243Am, are relatively high – 57.6 to 75.6 kg for 241Am and 209 kg for 243Am. Scarcity and high price yet hinder application of americium as a nuclear fuel in nuclear reactors. There are proposals of very compact 10-kW high-flux reactors using as little as 20 grams of 242mAm. Such low-power reactors would be relatively safe to use as neutron sources for radiation therapy in hospitals. About 19 isotopes and 8 nuclear isomers are known for americium. There are two long-lived alpha-emitters; 243Am has a half-life of 7,370 years and is the most stable isotope, and 241Am has a half-life of 432.2 years. The most stable nuclear isomer is 242m1Am; it has a long half-life of 141 years. The half-lives of other isotopes and isomers range from 0.64 microseconds for 245m1Am to 50.8 hours for 240Am. As with most other actinides, the isotopes of americium with odd number of neutrons have relatively high rate of nuclear fission and low critical mass. Americium-241 decays to 237Np emitting alpha particles of 5 different energies, mostly at 5.486 MeV (85.2%) and 5.443 MeV (12.8%). Because many of the resulting states are metastable, they also emit gamma rays with the discrete energies between 26.3 and 158.5 keV. Americium-242 is a short-lived isotope with a half-life of 16.02 h. It mostly (82.7%) converts by β-decay to 242Cm, but also by electron capture to 242Pu (17.3%). Both 242Cm and 242Pu transform via nearly the same decay chain through 238Pu down to 234U. Nearly all (99.541%) of 242m1Am decays by internal conversion to 242Am and the remaining 0.459% by α-decay to 238Np. The latter subsequently decays to 238Pu and then to 234U. Americium-243 transforms by α-emission into 239Np, which converts by β-decay to 239Pu, and the 239Pu changes into 235U by emitting an α-particle. You might think that a synthetic radioactive element that follows plutonium (94)—and has a significantly shorter half-life—would be some kind of superbomb material, available only to scientists in secret laboratories. Perhaps a mad scientist is studying americium in a lair somewhere, but if you want some yourself you can simply walk into any neighborhood hardware store, supermarket, or Wal-Mart and buy some, no questions asked. The reason is not that americium is fundamentally less dangerous than the elements around it. In fact, the commonly available isotope, 241Am, is significantly more radioactive than weapons-grade plutonium, and at least as toxic. No, the difference is simply that there is a useful application for americium that requires only a very tiny amount, and for which a company was prepared to go through the effort required to carve out and get a regulatory exception. The amount of americium in a typical new smoke detector is 1 microcurie (37 kBq) or 0.29 microgram. This amount declines slowly as the americium decays into neptunium-237, a different transuranic element with a much longer half-life (about 2.14 million years). With its half-life of 432.2 years, the americium in a smoke detector includes about 3% neptunium after 19 years, and about 5% after 32 years. The radiation passes through an ionization chamber, an air-filled space between two electrodes, and permits a small, constant current between the electrodes. Any smoke that enters the chamber absorbs the alpha particles, which reduces the ionization and affects this current, triggering the alarm. Compared to the alternative optical smoke detector, the ionization smoke detector is cheaper and can detect particles which are too small to produce significant light scattering; however, it is more prone to false alarms. As 241Am has a roughly similar half-life to 238Pu (432.2 years vs. 87 years), it has been proposed as an active element of radioisotope thermoelectric generators, for example in spacecraft. Although americium produces less heat and electricity – the power yield is 114.7 mW/g for 241Am and 6.31 mW/g for 243Am (cf. 390 mW/g for 238Pu) – and its radiation poses more threat to humans owing to neutron emission, the European Space Agency is considering using americium for its space probes. Another proposed space-related application of americium is a fuel for space ships with nuclear propulsion. It relies on the very high rate of nuclear fission of 242mAm, which can be maintained even in a micrometer-thick foil. Small thickness avoids the problem of self-absorption of emitted radiation. This problem is pertinent to uranium or plutonium rods, in which only surface layers provide alpha-particles. The fission products of 242mAm can either directly propel the spaceship or they can heat a thrusting gas. They can also transfer their energy to a fluid and generate electricity through a magnetohydrodynamic generator. One more proposal which utilizes the high nuclear fission rate of 242mAm is a nuclear battery. Its design relies not on the energy of the emitted by americium alpha particles, but on their charge, that is the americium acts as the self-sustaining "cathode". A single 3.2 kg 242mAm charge of such battery could provide about 140 kW of power over a period of 80 days. Even with all the potential benefits, the current applications of 242mAm are as yet hindered by the scarcity and high price of this particular nuclear isomer. The most widespread use of 241AmBe neutron sources is a neutron probe – a device used to measure the quantity of water present in soil, as well as moisture/density for quality control in highway construction. 241Am neutron sources are also used in well logging applications, as well as in neutron radiography, tomography and other radiochemical investigations. Irradiation of 241Am by 12C or 22Ne ions yields the isotopes 247Es (einsteinium) or 260Db (dubnium), respectively. 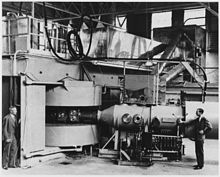 Furthermore, the element berkelium (243Bk isotope) had been first intentionally produced and identified by bombarding 241Am with alpha particles, in 1949, by the same Berkeley group, using the same 60-inch cyclotron. Similarly, nobelium was produced at the Joint Institute for Nuclear Research, Dubna, Russia, in 1965 in several reactions, one of which included irradiation of 243Am with 15N ions. Besides, one of the synthesis reactions for lawrencium, discovered by scientists at Berkeley and Dubna, included bombardment of 243Am with 18O. Americium-241 has been used as a portable source of both gamma rays and alpha particles for a number of medical and industrial uses. The 59.5409 keV gamma ray emissions from 241Am in such sources can be used for indirect analysis of materials in radiography and X-ray fluorescence spectroscopy, as well as for quality control in fixed nuclear density gauges and nuclear densometers. For example, the element has been employed to gauge glass thickness to help create flat glass. Americium-241 is also suitable for calibration of gamma-ray spectrometers in the low-energy range, since its spectrum consists of nearly a single peak and negligible Compton continuum (at least three orders of magnitude lower intensity). Americium-241 gamma rays were also used to provide passive diagnosis of thyroid function. This medical application is however obsolete. As a highly radioactive element, americium and its compounds must be handled only in an appropriate laboratory under special arrangements. Although most americium isotopes predominantly emit alpha particles which can be blocked by thin layers of common materials, many of the daughter products emit gamma-rays and neutrons which have a long penetration depth. If consumed, most of the americium is excreted within a few days, with only 0.05% absorbed in the blood, of which roughly 45% goes to the liver and 45% to the bones, and the remaining 10% is excreted. The uptake to the liver depends on the individual and increases with age. In the bones, americium is first deposited over cortical and trabecular surfaces and slowly redistributes over the bone with time. The biological half-life of 241Am is 50 years in the bones and 20 years in the liver, whereas in the gonads (testicles and ovaries) it remains permanently; in all these organs, americium promotes formation of cancer cells as a result of its radioactivity. Americium often enters landfills from discarded smoke detectors. The rules associated with the disposal of smoke detectors are relaxed in most jurisdictions. In 1994, 17-year-old David Hahn extracted the americium from about 100 smoke detectors in an attempt to build a breeder nuclear reactor. There have been a few cases of exposure to americium, the worst case being that of chemical operations technician Harold McCluskey, who at the age of 64 was exposed to 500 times the occupational standard for americium-241 as a result of an explosion in his lab. McCluskey died at the age of 75 of unrelated pre-existing disease. ^ The "metastable" state is marked by the letter m.
^ a b c Muller, W.; Schenkel, R.; Schmidt, H. E.; Spirlet, J. C.; McElroy, D. L.; Hall, R. O. A.; Mortimer, M. J. (1978). "The electrical resistivity and specific heat of americium metal". Journal of Low Temperature Physics. 30 (5–6): 561. Bibcode:1978JLTP...30..561M. doi:10.1007/BF00116197. ^ Seaborg, Glenn T. (1946). "The Transuranium Elements". Science. 104 (2704): 379–386. Bibcode:1946Sci...104..379S. doi:10.1126/science.104.2704.379. JSTOR 1675046. PMID 17842184. ^ "Demobilized Physics". LBL NEWS Magazine. 6 (3): 49. Fall 1981. ^ Street, K.; Ghiorso, A.; Seaborg, G. (1950). "The Isotopes of Americium". Physical Review. 79 (3): 530. Bibcode:1950PhRv...79..530S. doi:10.1103/PhysRev.79.530. ^ a b Pepling, Rachel Sheremeta (2003). "Chemical & Engineering News: It's Elemental: The Periodic Table – Americium". Retrieved 7 July 2010. ^ Robert E. Krebs (2006). The History and Use of Our Earth's Chemical Elements: A Reference Guide (Second ed.). Greenwood Publishing Group. p. 322. ISBN 978-0-313-33438-2. ^ Harper, Douglas. "pandemonium". Online Etymology Dictionary. ^ Harper, Douglas. "delirium". Online Etymology Dictionary. ^ a b c d e Audi, Georges; Bersillon, Olivier; Blachot, Jean; Wapstra, Aaldert Hendrik (1997). "The NUBASE evaluation of nuclear and decay properties" (PDF). Nuclear Physics A. 624 (1): 1–124. Bibcode:1997NuPhA.624....1A. doi:10.1016/S0375-9474(97)00482-X. Archived from the original (PDF) on 23 September 2008. ^ a b Westrum, Edgar F.; Eyring, Leroy (1951). "The Preparation and Some Properties of Americium Metal". Journal of the American Chemical Society. 73 (7): 3396. doi:10.1021/ja01151a116. hdl:2027/mdp.39015086480962. ^ Fields, P. R.; Studier, M. H.; Diamond, H.; et al. (1956). "Transplutonium Elements in Thermonuclear Test Debris". Physical Review. 102 (1): 180–182. Bibcode:1956PhRv..102..180F. doi:10.1103/PhysRev.102.180. ^ Eriksson, Mats (April 2002). On Weapons Plutonium in the Arctic Environment (PDF). Risø National Laboratory, Roskilde, Denmark: Lund University. p. 28. Archived from the original (PDF) on 18 December 2008. Retrieved 15 November 2008. ^ Hammond C. R. "The elements" in Lide, D. R., ed. (2005). CRC Handbook of Chemistry and Physics (86th ed.). Boca Raton (FL): CRC Press. ISBN 0-8493-0486-5. ^ Emeleus, H. J.; Sharpe, A. G. (1987). Advances in Inorganic Chemistry. Academic Press. p. 2. ISBN 978-0-08-057880-4. ^ Hudson, M. J.; et al. (2003). "The coordination chemistry of 1,2,4-triazinyl bipyridines with lanthanide(III) elements – implications for the partitioning of americium(III)". Dalton Trans. (9): 1675–1685. doi:10.1039/b301178j. ^ Geist, A.; et al. (11–13 December 2000). "Actinide(III)/Lanthanide(III) Partitioning Using n-Pr-BTP as Extractant: Extraction Kinetics and Extraction Test in a Hollow Fiber Module" (PDF). 6th Information Exchange Meeting on Actinide and Fission Product Partitioning and Transmutation. OECD Nuclear Energy Agency. ^ Hill, C.; Guillaneux, D.; Hérès, X.; Boubals, N. & Ramain, L. (24–26 October 2000). "Sanex-BTP Process Development Studies" (PDF). Atalante 2000: Scientific Research on the Back-end of the Fuel Cycle for the 21st Century. Commissariat à l'énergie atomique. Archived from the original (PDF) on 15 November 2012. ^ Geist, A.; et al. (14–16 October 2002). "Effective Actinide(III)-Lanthanide(III) Separation in Miniature Hollow Fibre Modules" (PDF). 7th Information Exchange Meeting on Actinide and Fission Product Partitioning and Transmutation. OECD Nuclear Energy Agency. ^ Ensor, D.D. "Separation Studies of f-Elements" (PDF). Tennessee Tech University. Archived from the original (PDF) on 22 September 2006. ^ Magnusson D; Christiansen B; Foreman MRS; Geist A; Glatz JP; Malmbeck R; Modolo G; Serrano-Purroy D & Sorel C (2009). "Demonstration of a SANEX Process in Centrifugal Contactors using the CyMe4-BTBP Molecule on a Genuine Fuel Solution". Solvent Extraction and Ion Exchange. 27 (2): 97. doi:10.1080/07366290802672204. ^ a b c Gmelin Handbook of Inorganic Chemistry, System No. 71, transuranics, Part B 1, pp. 57–67. ^ a b c Wade, W.; Wolf, T. (1967). "Preparation and some properties of americium metal". Journal of Inorganic and Nuclear Chemistry. 29 (10): 2577. doi:10.1016/0022-1902(67)80183-0. ^ a b Benedict, U. (1984). "Study of actinide metals and actinide compounds under high pressures". Journal of the Less Common Metals. 100: 153. doi:10.1016/0022-5088(84)90061-4. ^ a b c d McWhan, D. B.; Cunningham, B. B.; Wallmann, J. C. (1962). "Crystal structure, thermal expansion and melting point of americium metal". Journal of Inorganic and Nuclear Chemistry. 24 (9): 1025. doi:10.1016/0022-1902(62)80246-2. ^ Young, D. A. (1991). Phase diagrams of the elements. University of California Press. p. 226. ISBN 978-0-520-91148-2. ^ Benedict, U.; Dufour, C. (1980). "Low temperature lattice expansion of americium dioxide". Physica B+C. 102 (1): 303. Bibcode:1980PhyBC.102..303B. doi:10.1016/0378-4363(80)90178-3. ^ Kanellakopulos, B.; Blaise, A.; Fournier, J. M.; Müller, W. (1975). "The magnetic susceptibility of Americium and curium metal". Solid State Communications. 17 (6): 713. Bibcode:1975SSCom..17..713K. doi:10.1016/0038-1098(75)90392-0. ^ Mondal, J. U.; Raschella, D. L.; Haire, R. G.; Petereson, J. R. (1987). "The enthalpy of solution of 243Am metal and the standard enthalpy of formation of Am3+(aq)". Thermochimica Acta. 116: 235. doi:10.1016/0040-6031(87)88183-2. ^ a b Asprey, L. B.; Penneman, R. A. (1961). "FIRST OBSERVATION OF AQUEOUS TETRAVALENT AMERICIUM". Journal of the American Chemical Society. 83 (9): 2200. doi:10.1021/ja01470a040. ^ a b Coleman, J. S.; Keenan, T. K.; Jones, L. H.; Carnall, W. T.; Penneman, R. A. (1963). "Preparation and Properties of Americium(VI) in Aqueous Carbonate Solutions". Inorganic Chemistry. 2: 58. doi:10.1021/ic50005a017. ^ a b Asprey, L. B.; Stephanou, S. E.; Penneman, R. A. (1951). "Hexavalent Americium". Journal of the American Chemical Society. 73 (12): 5715. doi:10.1021/ja01156a065. ^ Asprey, L. B.; Stephanou, S. E.; Penneman, R. A. (1950). "A NEW VALENCE STATE OF AMERICIUM, AM(VI)". Journal of the American Chemical Society. 72 (3): 1425. doi:10.1021/ja01159a528. ^ Werner, L. B.; Perlman, I. (1951). "The Pentavalent State of Americium". Journal of the American Chemical Society. 73: 495. doi:10.1021/ja01145a540. hdl:2027/mdp.39015086479774. ^ Hall, G.; Markin, T. L. (1957). "The self-reduction of americium(V) and (VI) and the disproportionation of americium(V) in aqueous solution". Journal of Inorganic and Nuclear Chemistry. 4 (5–6): 296. doi:10.1016/0022-1902(57)80011-6. ^ Coleman, James S. (1963). "The Kinetics of the Disproportionation of Americium(V)". Inorganic Chemistry. 2: 53. doi:10.1021/ic50005a016. ^ Akimoto, Y. (1967). "A note on AmN and AmO". Journal of Inorganic and Nuclear Chemistry. 29 (10): 2650–2652. doi:10.1016/0022-1902(67)80191-X. ^ a b Asprey, L. B.; Keenan, T. K.; Kruse, F. H. (1965). "Crystal Structures of the Trifluorides, Trichlorides, Tribromides, and Triiodides of Americium and Curium". Inorganic Chemistry. 4 (7): 985. doi:10.1021/ic50029a013. ^ Baybarz, R. D. (1973). "The preparation and crystal structures of americium dichloride and dibromide". Journal of Inorganic and Nuclear Chemistry. 35 (2): 483. doi:10.1016/0022-1902(73)80560-3. ^ a b Asprey, L. B. (1954). "New Compounds of Quadrivalent Americium, AmF4, KAmF5". Journal of the American Chemical Society. 76 (7): 2019. doi:10.1021/ja01636a094. ^ Burns, John H.; Peterson, Joseph Richard (1971). "Crystal structures of americium trichloride hexahydrate and berkelium trichloride hexahydrate". Inorganic Chemistry. 10: 147. doi:10.1021/ic50095a029. ^ a b Damien, D.; Jove, J. (1971). "Americium disulfide and diselenide". Inorganic and Nuclear Chemistry Letters. 7 (7): 685. doi:10.1016/0020-1650(71)80055-7. ^ a b Roddy, J. (1974). "Americium metallides: AmAs, AmSb, AmBi, Am3Se4, and AmSe2". Journal of Inorganic and Nuclear Chemistry. 36 (11): 2531. doi:10.1016/0022-1902(74)80466-5. ^ Damien, D. (1972). "Americium tritelluride and ditelluride". Inorganic and Nuclear Chemistry Letters. 8 (5): 501. doi:10.1016/0020-1650(72)80262-9. ^ Charvillat, J.; Damien, D. (1973). "Americium monoarsenide". Inorganic and Nuclear Chemistry Letters. 9 (5): 559. doi:10.1016/0020-1650(73)80191-6. ^ Weigel, F.; Wittmann, F.; Marquart, R. (1977). "Americium monosilicide and "disilicide"". Journal of the Less Common Metals. 56: 47. doi:10.1016/0022-5088(77)90217-X. ^ Eick, Harry A.; Mulford, R. N. R. (1969). "Americium and neptunium borides". Journal of Inorganic and Nuclear Chemistry. 31 (2): 371. doi:10.1016/0022-1902(69)80480-X. ^ Elschenbroich, Christoph (2008). Organometallchemie. Vieweg+teubner Verlag. p. 589. ISBN 978-3-8351-0167-8. ^ Albrecht-Schmitt, Thomas E. (2008). Organometallic and Coordination Chemistry of the Actinides. Springer. p. 8. ISBN 978-3-540-77836-3. ^ Dutkiewicz, Michał S.; Apostolidis, Christos; Walter, Olaf; Arnold, Polly L. (30 January 2017). "Reduction chemistry of neptunium cyclopentadienide complexes: from structure to understanding". Chemical Science. 2017 (8): 2553–61. doi:10.1039/C7SC00034K. PMC 5431675. PMID 28553487. ^ Girnt, Denise; Roesky, Peter W.; Geist, Andreas; Ruff, Christian M.; Panak, Petra J.; Denecke, Melissa A. (2010). "6-(3,5-Dimethyl-1H-pyrazol-1-yl)-2,2′-bipyridine as Ligand for Actinide(III)/Lanthanide(III) Separation". Inorganic Chemistry. 49 (20): 9627–35. doi:10.1021/ic101309j. PMID 20849125. ^ Dodge, C.J. ; et al. (1998). "Role of Microbes as Biocolloids in the Transport of Actinides from a Deep Underground Radioactive Waste Repository". Radiochim. Acta. 82: 347–354. ^ MacAskie, L. E.; Jeong, B. C.; Tolley, M. R. (1994). "Enzymically accelerated biomineralization of heavy metals: application to the removal of americium and plutonium from aqueous flows". FEMS Microbiology Reviews. 14 (4): 351–67. doi:10.1111/j.1574-6976.1994.tb00109.x. PMID 7917422. ^ Wurtz, E. A.; Sibley, T. H.; Schell, W. R. (1986). "Interactions of Escherichia coli and marine bacteria with 241Am in laboratory cultures". Health Physics. 50 (1): 79–88. doi:10.1097/00004032-198601000-00007. PMID 3511007. ^ Francis, A.J. ; et al. (1998). "Role of Bacteria as Biocolloids in the Transport of Actinides from a Deep Underground Radioactive Waste Repository". Acta Radiochimica. 82: 347–354. doi:10.1524/ract.1998.82.special-issue.347. OSTI 2439. ^ Liu, N.; Yang, Y.; Luo, S.; Zhang, T.; Jin, J.; Liao, J.; Hua, X. (2002). "Biosorption of 241Am by Rhizopus arrihizus: preliminary investigation and evaluation". Applied Radiation and Isotopes. 57 (2): 139–43. doi:10.1016/s0969-8043(02)00076-3. PMID 12150270. ^ Pfennig, G.; Klewe-Nebenius, H and Seelmann Eggebert, W. (Eds. ): Karlsruhe nuclide, 7 Edition 2006. ^ Ronen, Y.; Aboudy, M. & Regev, D. (2000). "A novel method for energy production using 242mAm as a nuclear fuel". Nuclear Technology. 129 (3): 407–417. doi:10.13182/nt00-a3071. ^ Ronen, Y.; Aboudy, M. & Regev, D. (2001). "Homogeneous 242mAm-Fueled Reactor for Neutron Capture Therapy". Nuclear Science and Engineering. 138 (3): 295–304. doi:10.13182/nse01-a2215. OSTI 20804726. ^ Klinck, Christian. "α-decay of 241Am. Theory – A lecture course on radioactivity". University of Technology Kaiserslautern. Archived from the original on 6 July 2011. Retrieved 28 November 2010. ^ The Elements: A Visual Exploration of Every Known Atom in the Universe. Hachette Books. 3 April 2012. p. 220. ISBN 978-1-57912-895-1. ^ "Smoke detectors and americium-241 fact sheet" (PDF). Canadian Nuclear Society. Retrieved 31 August 2009. ^ Gerberding, Julie Louise (2004). "Toxicological Profile For Americium" (PDF; 2.1 MB). United States Department of Health and Human Services/Agency for Toxic Substances and Disease Registry. Archived (PDF) from the original on 6 September 2009. Retrieved 29 August 2009. ^ "Extremely Efficient Nuclear Fuel Could Take Man To Mars In Just Two Weeks". ScienceDaily. 3 January 2001. Archived from the original on 17 October 2007. Retrieved 22 November 2007. ^ Kammash, T.; et al. (10 January 1993). "An americium-fueled gas core nuclear rocket". AIP Conf. Proc. Tenth symposium on space nuclear power and propulsion. 271. pp. 585–589. doi:10.1063/1.43073. ^ a b Ronen, Y.; Shwageraus, E. (2000). "Ultra-thin 242mAm fuel elements in nuclear reactors". Nuclear Instruments and Methods in Physics Research Section A: Accelerators, Spectrometers, Detectors and Associated Equipment. 455 (2): 442. Bibcode:2000NIMPA.455..442R. doi:10.1016/S0168-9002(00)00506-4. ^ a b Binder, Harry H. (1999). Lexikon der chemischen Elemente: das Periodensystem in Fakten, Zahlen und Daten : mit 96 Abbildungen und vielen tabellarischen Zusammenstellungen. ISBN 978-3-7776-0736-8. ^ Division of Environmental Health, Office of Radiation Protection (November 2002). "Fact Sheet # 23. Americium-241" (PDF). Archived from the original (PDF) on 11 November 2010. Retrieved 28 November 2010. ^ "'Radioactive Boy Scout' Charged in Smoke Detector Theft". Fox News. 4 August 2007. Archived from the original on 8 December 2007. Retrieved 28 November 2007. ^ "Man dubbed 'Radioactive Boy Scout' pleads guilty". Detroit Free Press. Associated Press. 27 August 2007. Archived from the original on 29 September 2007. Retrieved 27 August 2007. ^ "'Radioactive Boy Scout' Sentenced to 90 Days for Stealing Smoke Detectors". Fox News. 4 October 2007. Archived from the original on 13 November 2007. Retrieved 28 November 2007. ^ Cary, Annette (25 April 2008). "Doctor remembers Hanford's 'Atomic Man'". Tri-City Herald. Archived from the original on 10 February 2010. Retrieved 17 June 2008. ^ AP wire (3 June 2005). "Hanford nuclear workers enter site of worst contamination accident". Archived from the original on 13 October 2007. Retrieved 17 June 2007. Wiberg, Nils (2007). Lehrbuch Der Anorganischen Chemie. De Gruyter. ISBN 978-3-11-017770-1. Nuclides and Isotopes – 14th Edition, GE Nuclear Energy, 1989. Fioni, Gabriele; Cribier, Michel & Marie, Frédéric. "Can the minor actinide, americium-241, be transmuted by thermal neutrons?". Commissariat à l'énergie atomique. Archived from the original on 11 November 2007. Stwertka, Albert (1999). A Guide to the Elements. Oxford University Press, USA. ISBN 978-0-19-508083-4. Wikimedia Commons has media related to Americium. Look up americium in Wiktionary, the free dictionary.